Rather than leave a smooth face on the wedge of the tusk tenon joint on the sawbuck table, I decided to jazz it up a bit with a carved pattern. The design is very small, only 1.125" in diameter. 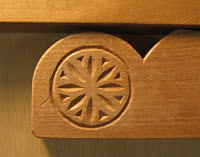 A bench hook, a piece of scrapwood, and a nail kept the wedge from moving while I carved the design. Chip carvers would reach for a carving knife to make this pattern, but I fare better with lettercarving techniques. 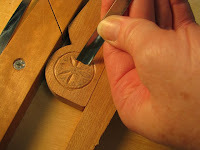 I used a straight chisel and a gouge with a #3 sweep and made exactly the same cuts I use in lettercarving (here & here). The only difference is I angled the tools at a steeper pitch. A 20º angle just seemed too shallow. 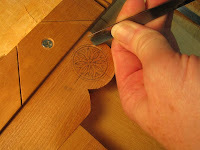 The gouge made all of the concave cuts: the outside wall of the circle and the petal shapes. And the chisel made the other cuts: the inside wall of the circle, which is convex, and the triangles. 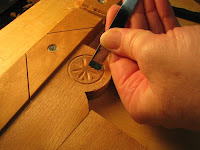 To make the triangles, just slide the corner of your chisel into the outer edge of each of the 3 walls, keeping your chisel at an angle, around 60º, and push it down to the middle of the triangle—the point at which all three walls meet. 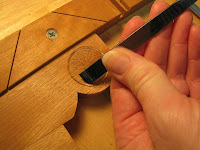 Finally, a chisel and block plane were used to chamfer the sharp edges of the wedge. You can see in the close-up that the final design is far from perfect, in fact, my gouge slipped outside the circle a few times. Hopefully no one will inspect it that closely, but if they do, I'll just tell them I was trying to be authentic!